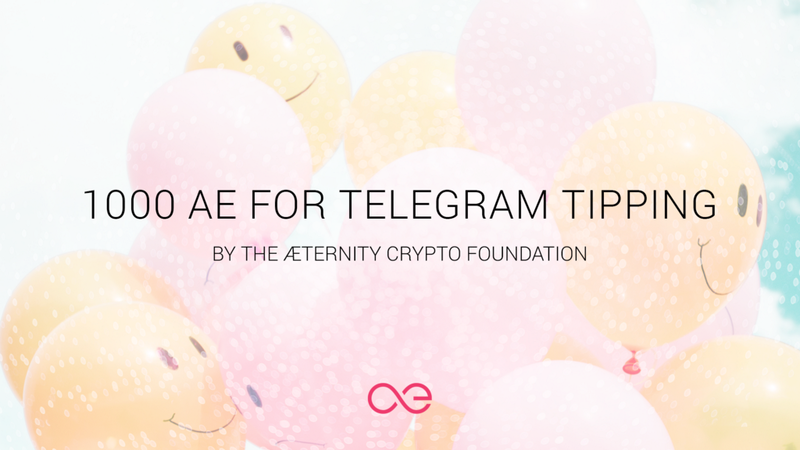 We are thrilled to announce that the æternity Crypto Foundation will donate 1000 AE per month, to be distributed via tips using the æternity Telegram Tip Bot. dedicate 1000 AE per month to support valuable contributions to the æternity ecosystem and stimulate positive interactions between community members. The AE tokens will be distributed via tips, using the Telegram Tip Bot, originally developed by community member Kryztoval. All tips will be done in æternity’s main Telegram group. The decision whom to tip will rest with æternity’s team and its community managers. Any guide, tutorial, helpful comment, useful information, [re]shared info in an external channel, provision of support or any other action that creates value for the æternity ecosystem could potentially receive a tip in AE tokens. The action does not have to originate in Telegram. Users in all channels, (Twitter, Reddit, Forum, Bitcointalk, etc) could receive a tip for their support. They will only need to join the main Telegram group, create a Tip Bot AE address (very easy, instructions here) and share it with the person who is tipping them. Kryztoval, the Tip Bot creator, already received a tip in AE from the æternity Foundation for his work. MrRobot, who prepared a guide on how to install an æternity node on AWS (Amazon Could) just received a tip, too. Smaller tip amounts will be dedicated to useful comments, [re]shares and support. We are looking forward to all [micro] contributions! We hope this initiative will create positive feedback loops that will further improve interactions between users in the æternity community.